Tomorrow is the 44-year anniversary of Roe vs Wade. That's the 1973 Supreme Court verdict that struck down all state prohibitions against abortion and made it a constitutionally protected act. In 1973—that tragic year from which Abort73 takes its name—there were 615,831 abortions performed in the United States. By 1979, the annual abortion total had more than doubled, peaking in 1990 at somewhere around 1.5 million. For the next decade, the annual abortion total fell by around 2% each year. The annual decrease slowed to roughly 1% for the next eight years. Then in 2009, the annual abortion total started falling by an average of more than 4% per year—at least through 2014. In what has become an annual exercise for me each January, I have been gathering state-by-state abortion numbers so as to project a nationwide total for 2015. I do this for two reasons. First, most states release their abortion data far in advance of the federal government. The Centers for Disease Control (CDC) didn't publish their 2013 abortion numbers until the end of last November. By that time, most states had already posted their abortion totals for 2015. Second, a few states—including California—do not record or report the abortions that occur within their borders. Since approximately 17% of all abortions happen in California, this skews the federal abortion tally considerably. The only way to fill in this missing data is to rely upon the Guttmacher Institute, the abortion industry’s own private research-arm, which directly queries all abortion providers in the country to assemble their annual abortion totals. However, the Guttmacher Institute does not compile abortion totals each year. In general, they only release new data every three years. For the last few years, I have used their 2011 abortion numbers as a baseline for projecting more current abortion totals. I was preparing to use those numbers again last week when the Guttmacher Institute released new abortion numbers for 2014. Those numbers have now been used to update our U.S. Abortion Statistics page, as well as all 51 of our state (and district) pages. Their 2014 numbers also served as my reference point for extrapolating an abortion total for 2015. By way of review, my initial abortion estimate for 2014 was 974,510. As more states reported throughout the year, that number was adjusted down to 954,616. As it turns out, that number was almost 3% higher than Guttmacher’s official tally. They report that 926,240. U.S. abortions occurred in 2104, which is a reduction of 12.5% from 2011—when there were a reported 1.06 million abortions. By contrast, total U.S. births increased by .95% between 2011 and 2014. Without any further ado, my calculations indicate that approximately 906,369 abortions took place in the United States in 2015. That's a one-year decrease of 2.1%. To arrive at that number, I took the 30 states that have already reported for 2015 and tallied their abortion totals for 2014. I then divided that number by the total number of 2014 abortions, as reported by the Guttmacher Institute. 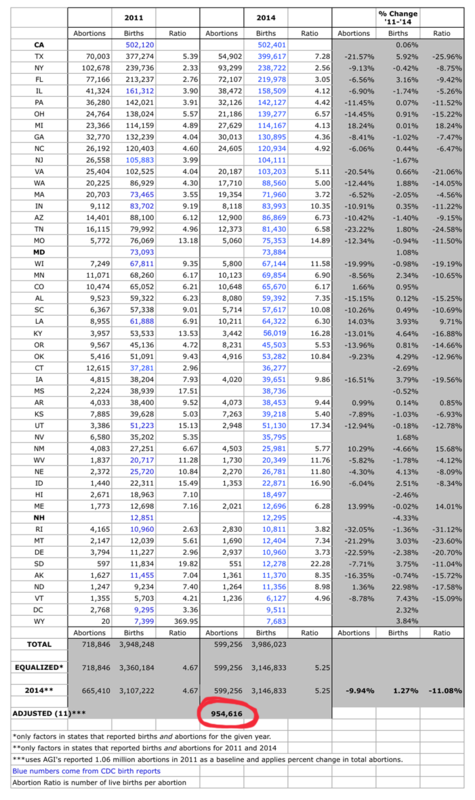 Determining that these 30 states account for roughly 42% of all U.S. abortions, I then tallied their 2015 abortions (381,048) and multiplied the total accordingly; 381,048 is 42% of 906,369. As has been the case for the last decade and more, this is both good news and bad. The good news is that the U.S. abortion total has fallen to almost half of what it was at its peak. Somewhere around 700,000 fewer human beings were killed by abortion in 2015 than in 1990. The bad news is that more than 900,00 innocent and helpless human beings were killed by abortion in 2015—in the United States of America. That easily surpasses the death toll of both heart disease (614,348) and cancer (591,699), which were the two leading causes of death in America (2014). And unlike heart disease and cancer, abortion is entirely preventable. It is not a disease; it is an act of violence against the weakest members of the human community. And instead of targeting its victims at the end of life, it targets them at the very beginning. Over a year has passed. During that year I barely thought of my little one. Until recently. I sit here almost every morning, and look at those ultrasound pictures for so long, and cry. I wonder if my baby would have his daddy's striking blue eyes or my wild curly hair. I wish I could kiss those fingers and toes. Or just cradle him in my arms. I will be 18 this year, and this is my biggest regret. I know it would have been hard, but I believe it would have been worth it. Two girls I know got pregnant the same time I did; their son and daughter are now over a year old. The same age my little one would be. They both tell me they wouldn't give up motherhood for anything. I watch them post pictures with their babies, while I sit here alone and cry. I wish I could have a do over. Each of us is surrounded by women and men who will face a crisis pregnancy this year. The problem is, they’re almost impossible to identify. So what do we do? Do we give into apathy and despair? Or do we do what we can to influence the way our campus or community thinks about abortion? If you count yourself among the latter, Abort73 T-shirts and promo cards are a great way to introduce those around you to the massive clearinghouse of free information that is Abort73.com. And if you really want to combat abortion in 2017, join us as a monthly donor. We may not be able to reach everyone this year with the truth about abortion, but that’s no reason not to try!